Rollin Karg begins to shape a piece of molten glass. The artistic works of local artist Rollin Karg can be found in galleries all over the world. His pieces combine two artistic mediums--sculpted metal and blown glass. Karg says he never knew he was an artist and discovered his talents by accident. The constant hum of a furnace and the clanking and pounding of metal echo through the air outside of Karg Art Glass. Steel sculptures tower near the edge of the property. Vibrant glass platters decorate the fence--blue, orange, yellow and green--displayed together a moving wave of color. "I just accidentally fell into this glass thing, but once I did, it was like you know a middle-aged guy falls in love with his teen-aged secretary. That's like me. I mean I was like boom,” Rollin Karg explains. He is a wiry man with cheerful eyes full of enthusiasm. He looks nothing like his 69 years. “I couldn't think of nothing else, I dreamed about it. I talked to my friends until their eyes rolled up in their heads and then thank god we've been able to make a living out of it," he says. "If it'd been something like bass fishing we would've been really in bad shape." Karg has been working with glass for more than three decades, creating everything from paperweights to abstract sculptures standing four feet high. 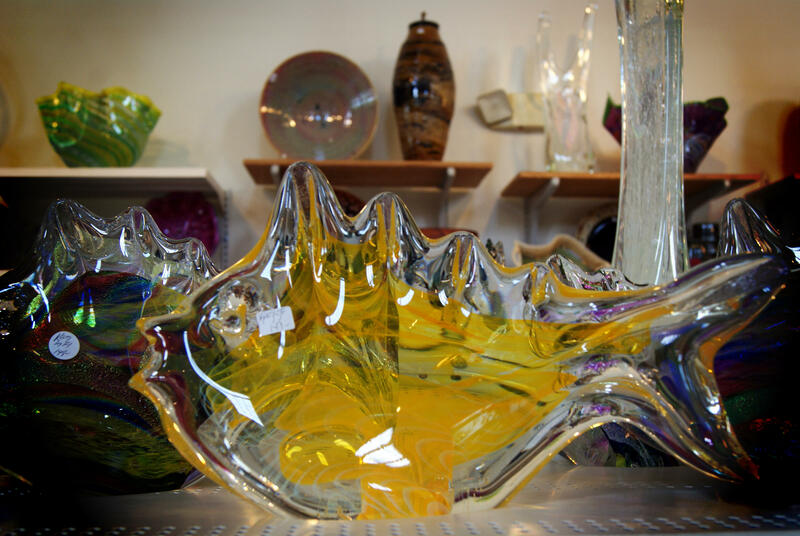 Most are transparent with striking bursts of color that seem to be alive within the glass. Karg stands in front of a glowing furnace in his open-air hot shop, seemingly unaware of the intense heat radiating around him. He gestures toward a stack of dinner plate sized sand bags wrapped in brown butcher paper. “This is the stuff right here. Now this is actually just silica, but this is where sand starts. So we make up a mixture of sand, silica, soda ash, about six or seven other ingredients," he says. Rollin Karg stands in front of the furnace he uses to cool his finished pieces of glass art. Karg says creating art glass is just basic chemistry. And a whole lot of heat, which is generated from the furnace he opens. This furnace is the first one of the three used in the glass blowing process. “The way this works, we take the glass — its called batch, the mixture of sand soda ash and what have you— we turn this furnace up to about 2250 and throw this in in bags. They weigh about 25 to 27 pounds each," he says. 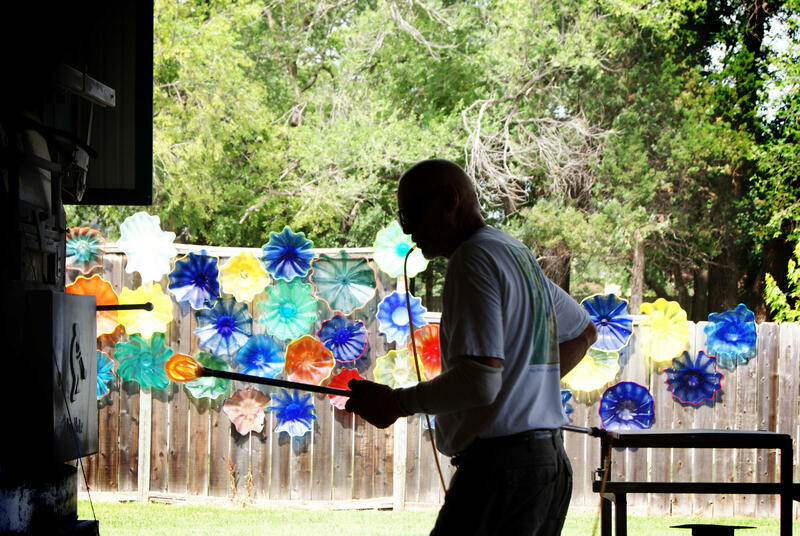 Karg makes his own clear glass and colored glass using minerals or purified metal salts. He also buys premade colored glass in various forms. A few of the different colors of frit Karg uses in his glass art. Frit looks like colored gravel. 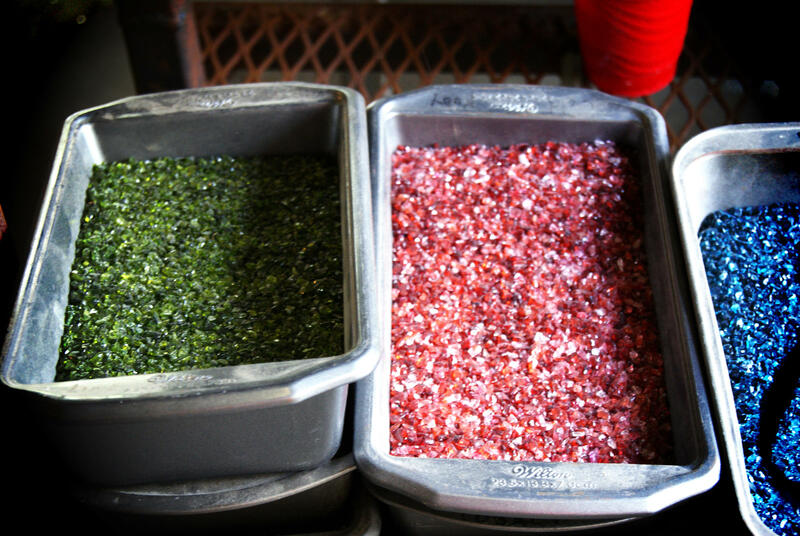 About a dozen different colors of the rocky glass pieces sit on carts throughout the hot shop. Closest to Karg, spread out on a cookie sheet is a handful of frit in varying shades of dark blue. A few pieces are almost black. The second furnace Karg uses when making a piece of art glass is called the glory hole. It’s barrel shaped and runs at about 300 degrees hotter than the first furnace. On the face of the glory hole, a soccer ball-sized opening glows orange with heat. The third and final furnace is used to slowly cool the finished glass pieces. In Karg's shop, this is done with old metal pizza oven he gutted and rewired after buying them at various auctions. Today, this furnace is filled with intricate glass fish, tails bent as if swimming upstream. There are also abstract glass sculptures, stretched into shape by gravity. Karg’s work is more than just melting and blowing glass, though. It’s a combination of specific scientific calculations, artistic talent and business sense. “Ya, there's a lot of science here. I just got a note from a friend of mine yesterday the glassblowing is the easy part," Karg laughs. "The economics of being a glass blower are brutal. You know, when I first moved into this building about 10 years ago, gas prices were going up and my gas bill for January of that year was $15,900. And in February it was $17,000...ya." Nevertheless, Karg's business in Kechi, just north of Wichita, has continued to grow. Which is quite an accomplishment, considering that being an artist wasn’t something he ever anticipated. "I had no idea I was an artist," Karg says humbly. "My dad was a carpenter all of his life and his dad was a contractor, so of course I wanted to be like them. They were big strong hardworking guys; they could do anything. But they told me, we want you to be the president of some company and so I just took it for granted that that was my destiny. I went to Wichita State. I was a business major. I went to work in industry and I did pretty good and I made a living but I never felt like I had found my place, my spot." A sculpture outside of Karg's gallery. He made a similar sculpture out of stainless steel that sold for $53,000. It’s safe to say now though, that Rollin Karg has found his spot, which has expanded to include not just blowing glass, but sculpting metal, which he does in the metal fabricating facility he originally used to build things for his hot shop. "Basically what happened was, we just got a little carried away with the metal." It started with a sculpture show for Larksfield Place, a retirement home in Wichita. 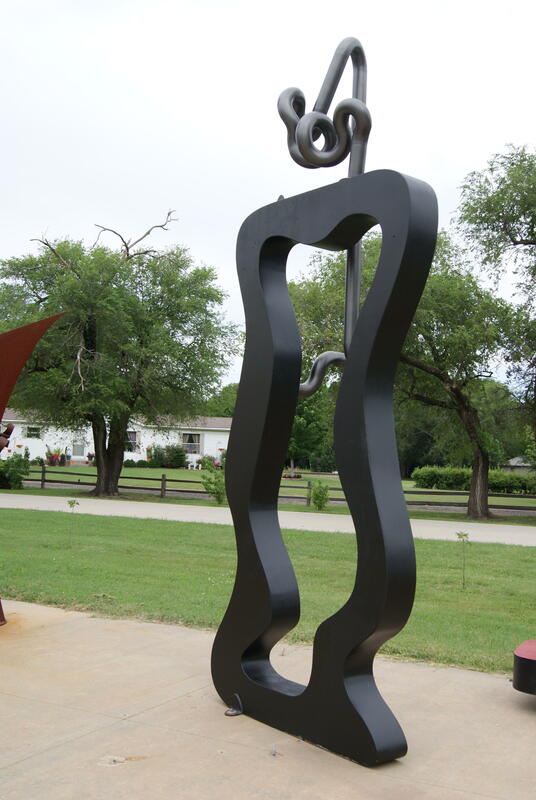 Karg gestures to the abstract steel sculptures around the edge of his property. A few have colored glass disks the size of hubcaps attached to them. Rods of metal with spheres on the ends jut out of the top of another. The biggest is a thick black piece with the middle cut out. His sculptures combining metal and glass have since been installed as public art exhibitions in Colorado Springs, Chicago and Hilton Head. 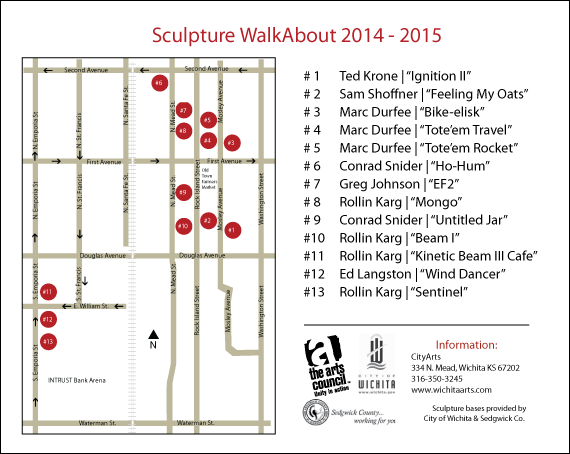 In Wichita, he has four sculptures on display down as part of the Wichita Sculpture WalkAbout. Some of them are kinetic pieces with moving parts. So, even though Karg didn't follow exactly in the plans his dad and grandfathers laid out for him, his accomplishments and unexpected success didn’t fall short of their expectations. "One time we were sort of baring our souls and I talked to him about it and I said 'It didn't work out like you thought', 'no' he says, 'but I really like what you're doing' and he says 'but you are the president of a company,' he says, 'its just a real small one.'" Permission given by the Wichita Art Museum. The Wichita Art Museum’s permanent collection has strong holdings in Early Modernism from the United States, with notable artists such as: Edward Hopper, Arthur Dove, John Singleton Copley and Mary Cassatt. But did you know it also has an exceptional collection of American glass? The majority of the glass holdings are Steuben Glass - a pinnacle of American artisanship. Steuben Glass was founded in 1903 and produced high-end decorative glass for over one hundred years, until its closing in 2012.